Today we spent quite a lot of time talking about, and making our own Class on Air sites. Manaiakalanai Google Class on Air is an initiative that showcases how teachers teach using digital technology and its affordances. You can see one example here. 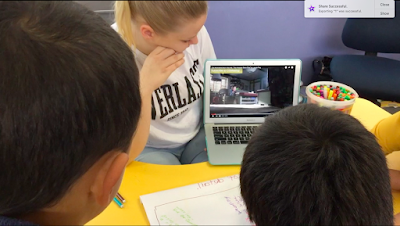 The teacher films themselves and a group of students doing a particular lesson, and shares the video, the planning, a reflection and the student outcomes of said lesson. The idea behind this is to share pedagogy - it is not about 'watch me I'm the best', but more about check out what I am doing, take any ideas you want and give me your feedback in response. All the MDTA's were challenged to create a Class on Air episode. Before we could do this, we had to build the Class on Air site on which to put it. When I record my session, I will share the work of these 5 students. I chose them because 3 of them are quite talkative, so will make a good video, and the other 2 need encouragement to talk more. Perfect match! The content I put in this page was about the treasure map, but when I do it properly I will do a guided reading or writing lesson with them. After the talk with my class last week about how they were bored doing the same kinds of tasks all the time, I wanted to change it up for them a bit.. I planned to teach them about orientation and direction (as per our maths overview for term 4), but through a project-based learning model. The project..? Making treasure maps! I intended to do a small bit of this project everyday, finishing on Thursday (as I am not at school on Fridays). However because of testing and practising for the testing, it didn't happen. Instead, we started and finished within a day. We had to move quite quickly through the content, but as it was a range of different 'stuff' for the kids to do, they were far from bored. At times they struggled to keep up with me..
Firstly, I introduced the challenge. (To be honest - the kids seemed quite confused at having been given a challenge, it was kinda funny. They are clearly not used to this kind of learning). We talked through the first few slides from here. We watched the clip on slide 6, then went outside to practice our understanding. As our practice, I included this game as a physical kinaesthetic activity, and the kids did request more games and they wanted to go outside more. Perfect solution! If you have ever played Captain's coming, it is the same game, just with changed labels. After morning tea, we worked through slides 8-12. Slide 12 asks students to record a video of themselves explaining what the directions were to a buddy. This was crazy! All the kids of course needed a quiet space so their voice could be heard, so they spread out through the class, corridor, staff room and stairwell foyer. I gave them only 5 minutes to do this, as we had to work quickly in order to finish within a day. Most managed to complete this, however didn't have time to actually put it onto the slides (it takes a lot of work to do this..). Next, we worked through slides 13-25. These kids have learnt about measurement/length before, so we did a quick recap so they could remember. Next - the students formed their own groups and we went outside. I gave them 20 minutes to plan their treasure hunt for the other group. Although again, this was crazy, with kids everywhere outside, it was preeeeeettty awesome. I did not facilitate any of the groups - they did it themselves. I wondered around, taking snippets of footage and checking in with them. I gave the Ipad to one of the groups, who after a bit of help went off without me and continued working. I LOVE their footage - just them talking within their own group, counting the number of steps together, recording, discussing etc. Once they had completed their maps, they gave them to me for safe keeping and went off for lunch. After lunch, I had set up the 'treasure' (bags of chocolate) and sent off one kid from each group to hide it according to their map. We went outside again, and I swapped the maps between the groups. And off they went! All the groups except one found their missing treasure by following the steps on the map. The group that didn't, couldn't, because the person who had hid the treasure, didn't hide it where the map said it would be (ugh!). Although it was crazy, and rushed, it was a great day of learning - and something I hope the kids remember. Without realising it, as they were so caught up in the 'map' business, they had learnt about orientation, direction and position, they had revised measuring in cm's and what to measure in what unit. What surprised me, and made me most happy, was the teamwork the kids showed. I didn't help any groups beyond correcting their unit of measurement or offering a suggested starting point to one group (e.g. the cone), they did it completely themselves. I love in the videos how you can see and hear them working together. They were patient, they took turns, they discussed, they disagreed and agreed, negotiated, proved, etc. Because of all the inter-personal learning that was happening, it made this activity much richer than I had even intended it to be. Today is the term 4 Digital Immersion PLG. This is when all the first year teachers to Manaiakalani come together for digital immersion, and the MDTA join them. 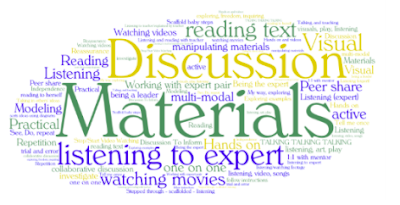 Today we are starting with talking about how our students learn..
We first talked about it..
Then we wrote about it..
Then Dorothy and Fiona created word clouds with our ideas. All of this feeds into the idea that all students learn best, in different ways. This doesn't mean that every single student needs individualised content which best meets their preference. That's just not feasible. However it does mean, that teachers should include aspects of different learning styles into their planning to consider these students. 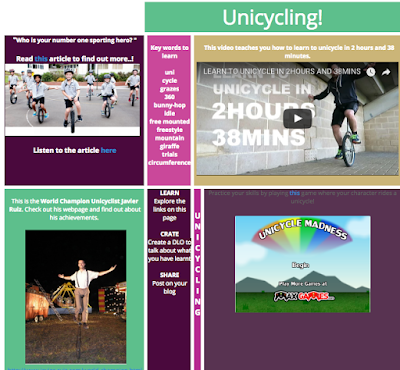 These are Google Sites designed to have different types of content on them - videos, pictures, things to read, things to do, etc, all based around one general topic, idea or theme. Not everyone learns the same, in the same way. We are limiting students by forcing them to learn in one particular way, and show their learning in one particular way. Keep in mind that 'texts' does not mean a book! Texts can be comic strips, video clips, a written text online or in a book, etc. MULTI-MODAL IS NOT THE SAME AS MULTI-TEXTUAL. I played around with sites and tried to remember everything I have learnt (back in April/May). It was very helpful for me to help two teachers from my school who have no experience with Google Sites as I had to explain/show/etc which cemented my own learning. This afternoon we had a staff meeting with Sue Pine, our maths PD lady. After having a great observation and getting lots of testing done throughout the day, I was ready and eager to learn from her. This is exactly what I thought of - ala year 12 Calculus.. So, how the heck does this happen for my 8 year olds? -how much does a T-shirt cost? -how much is a drink? Sue told us NOT to use algebraic equations to solve, so I used trial and error which made the most sense to me. 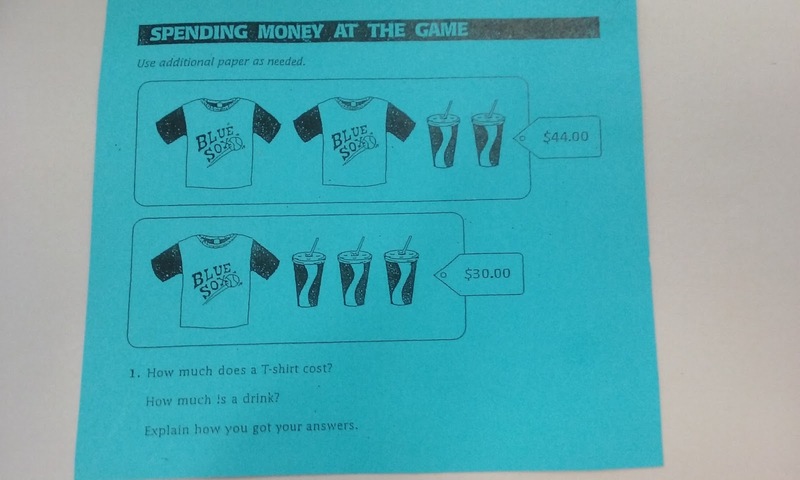 I first started with a t-shirt being worth $20, hence a drink being worth $2, based on the first equation. The second equation then didn't add up to $30.. so it couldn't be that.. So, I made the cost of the drink higher. 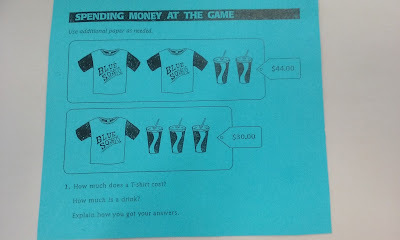 I tried $17 for a shirt and $5 for a drink.. again, it didn't add up for the second equation. This time it was too much.. So I made the cost of the drink less.. this time $3 and the t shirt was $19. Again, not enough for the second equation. So I made it in between - $4. and hence t-shirts cost $18. Another way we could have solved it was by using what was the same in each equation - each one had one t shirt and one drink. Half of $44 is $22, so one shirt and one drink cost $22 together. 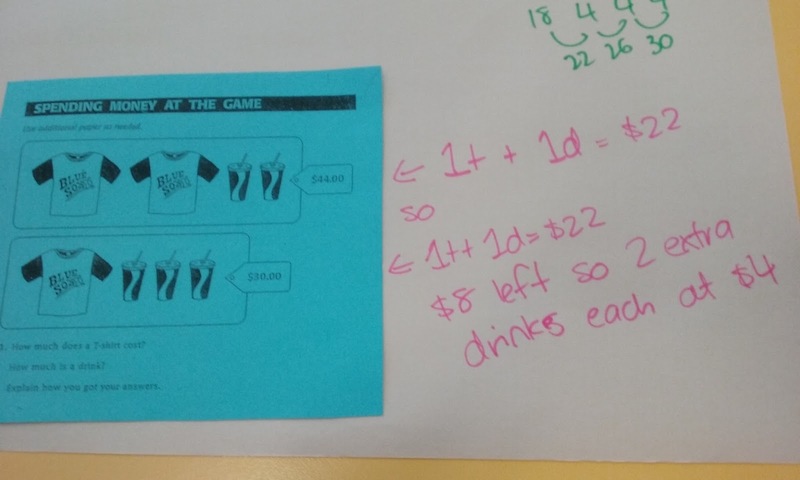 In the second equation, you are left with $8 so each drink here costs $4. 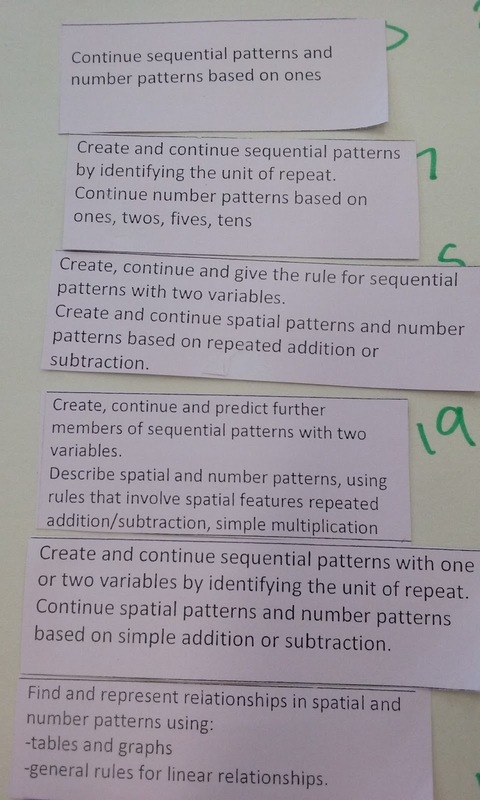 Then we talked about the maths progressions and put them in order.. 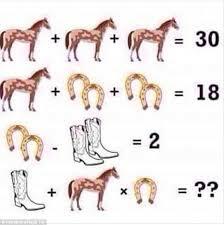 I see stuff like this all the time, especially on my Facebook feed where people fight over the answer. I now realise, this is algebra! This isn't just some silly game. This morning I had my final observation from Paula Were (our literacy PD lady) on writing. To be honest, I was not feeling overly great about it - I was just feeling very tired, have pressure from uni assignments etc etc. Just not excited about it, ya know? But I decided that whatever will be will be, and tried to just move on with my day. I wanted to show Paula how I have been using videos in writing as I have found it so effective with our target students. Archana was with Paula (as she is the head of literacy) and the syndicate leader Aireen came to watch as well. Here is my planning for this lesson. Firstly, we talked about the WALT and co-constructed the SC. 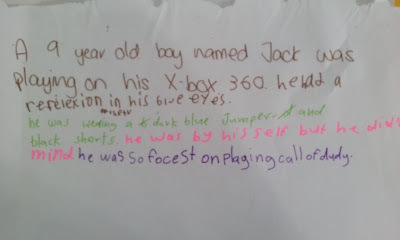 This included me giving them an example sentence 'the girl went down the stairs' and the students recorded their suggestions about how to add detail to make the sentence better to get their head around what 'detail' meant. Next, I introduced our video prompt. I played it once through, and asked the students to record whatever thought they had about the clip. We went through the clip again, and I paused at particular parts I wanted to emphasise. At these points I would scaffold the students to realise something the hadn't, use particular words (e.g. reflection), make them think deeper about a particular point (e.g the characters feelings). After we had brainstormed lots of detail about the character, we then formed sentences which would make a paragraph. I wrote the first sentence for this to show students how we can combine ideas from different people and write it TOGETHER (i.e. teacher modelling). Here is what we wrote together. After this, I asked the students to go back to our WALT and SC and tick the things they thought we had done - they did this. One student pointed out that although we wrote we should include a simile, we didn't actually include one. I agreed, and said that can be our next steps for next time - making sure we do include one. 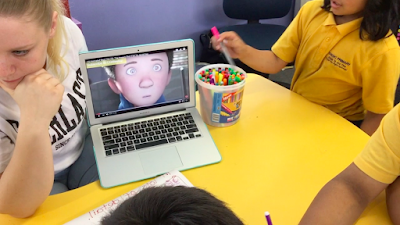 After this, the kids watched the rest of the clip (they were interested and hooked into this character and wanted to find out more..) and I went with Paula, Archana and Aireen. 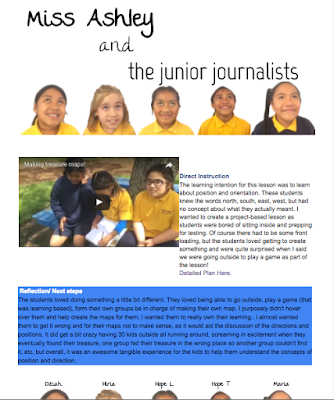 We interviewed a couple of the kids to check their understanding of the lesson (did they understand what the aim was? did they know how to achieve it? did they know who/what helped them?). After that, Paula, Archana, Aireen and I discussed my lesson and checked it off against a teacher criteria for effective writing practice (I will link this doc here once I receive it). I would love to hear your feedback on this lesson! Today, and lately, I have been thinking about how digital technology will affect and change teaching more and more. At Ulearn, I experienced two major breakouts in this field - the OMGTech session and the session where a teacher explains how she did game coding with her class. From someone somewhere, I was linked to this. This is an idea about what education in NZ will look like in 2025.. Have a read.. Even now, we are starting to see this type of education already - kids using VR and augmented reality (I myself have done this with the Anatomy 4D app), teaching kids to code and programme, and preparing them for jobs that don't yet exist. Education has become an active social process, compared to the passive content-retention classrooms of the past. What will be the next big thing? How will this change the role and need for teachers? 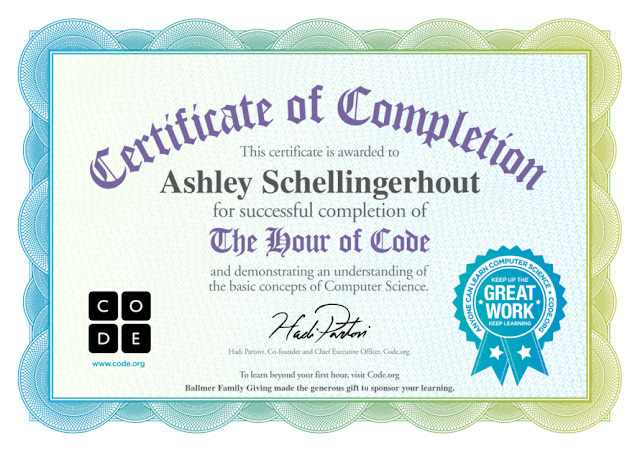 On that note, today we did Hour of Code. This is a digital coding programme is designed for children and adults alike, to slowly, step-by-step, introduce the key ideas behind game coding and get you doing each of these steps, before setting you off to make your own game/play around. There are two main ways of coding.. Using blocks (i.e. like Scratch) and using Java script (i.e. like I did when I programmed the robot at Ulearn). Here are two videos made up of screenshots, of me working through the two types of game formatting. I found the Hour of Code really helpful and easy to use - it builds your skills one by one and exposes you to more complex ideas as you progress. This approach would be much better suited to kids, rather than jumping straight into using Scratch or Gamefroot with no preparation beforehand. I think when I do coding with my kids (either end of this term, or next year..) I will follow this semi-structure. 1. Introduction to games (boardgames, knucklebones, card games etc) - aim: to build understanding of the purpose of games, the reason/need for instructions and get kids evaluating/reviewing games to see strengths and weaknesses. 3. Use scratch to build onto basic game understandings - multiple characters, how to build in levels/points. 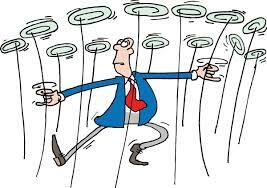 Any game with no specified purpose - just practice! 5. 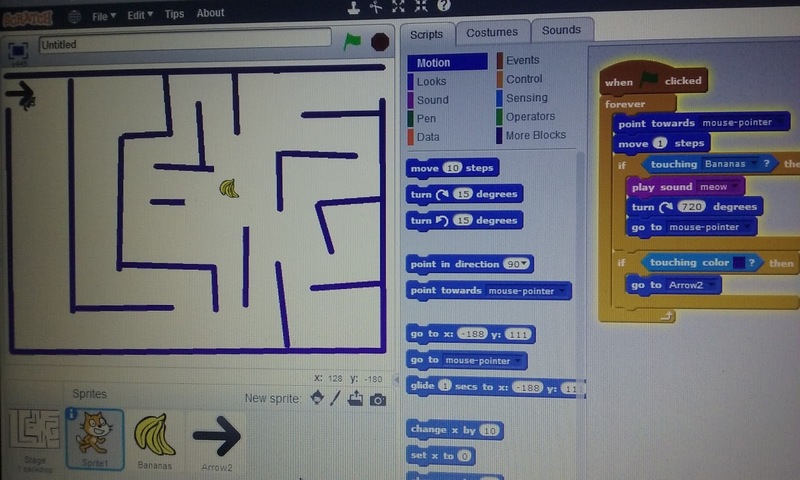 Students form groups and design, then build, their own game using scratch. I think I would also like to have a 'code club' as a lunchtime activity where students from any year level can come and code together to revise/build upon their skills. 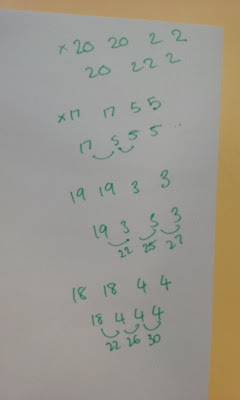 Today I took four of my top students (for maths) and did a half hour session on decimals. 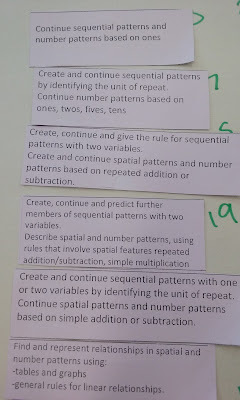 Although they don't necessarily NEED to know about decimals at this level, these students have the mental capability to understand this concept and actually have been asking to learn about it for a while..
Sue modelled to myself and another teacher Kaveeta last term how to use Decimats. I had never heard of these before, so was quite intrigued by that session. So for today's decimal session, I printed my own decimats and used them with the kids. Firstly, we established what was one whole. 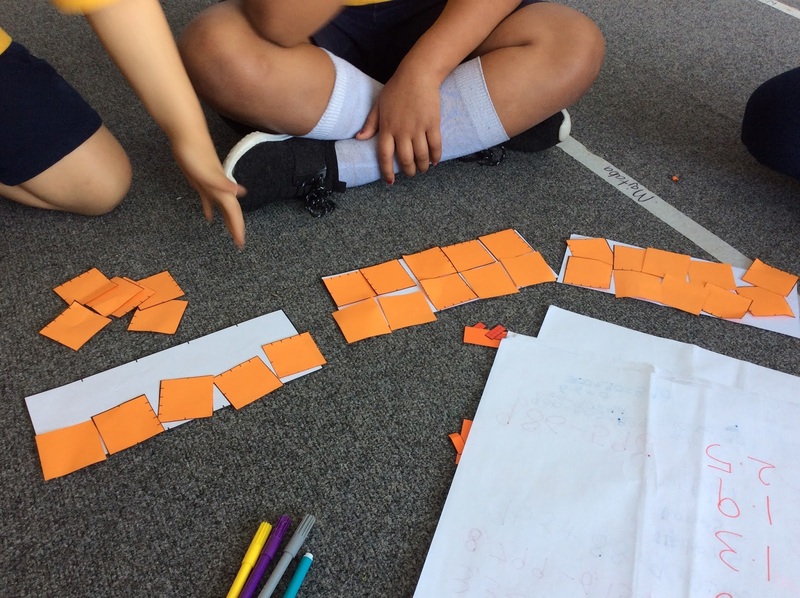 These kids have a very solid understanding of fractions, so all I asked them to do was cover their 'whole' with the light orange squares. One of the boys instantly said 'these are tenths because ten pieces altogether make up one whole'. Amazing! The decimats afforded a visual way for the kids to see that the ten orange pieces did indeed cover/make up the 'whole' (the white piece of paper). We kept the 'whole' piece under our work all the time to remind us that with fractions and decimals, we are talking about something that is smaller than one whole. Once we had established that the light orange squares covered one tenth of the whole each, I wrote down the number 0.1. We talked for a little bit here, to ensure that we understood the 1 in this number showed one tenth, not one whole. If it was one whole, it would be 1. Having the numbers written down, and having the decimats at the same time really helped clarify this. Next, I tested them by asking them to work with their buddy..
After some initial 'huh?' about how they could show one whole number AND part of a number, they remembered that one whole is the same as ten tenths, so both pairs covered one 'whole' with tenths then used another 'whole' to show the 5 tenths/0.5... I was quite impressed! Next, I introduced hundredths. I put ten small dark orange pieces on top of one light orange tenth. We talked about how that piece is EVEN smaller than one tenth, so the number must be bigger (i.e. one tenth is smaller than one fifth in reality, but the number/word is bigger - ten/five). After some discussion, and various illustrations, they clicked that ten pieces inside ten pieces must mean that there are 100 pieces - hence one hundredths. We did some 'show me...' using hundredths as well. Then we talked about thousandths. In all honesty, they got a bit lost here, but thats perfectly okay. Their minds had already been stretched so much in the past 20 minutes I wasn't going to go on and on about thousandths (and they don't need to know about them for Stage 5 maths anyway!). Then we did some 'show me...' using all the different types of paper/decimal place value. I would write down the number e.g. 2.43 and not explain it or give any hints. 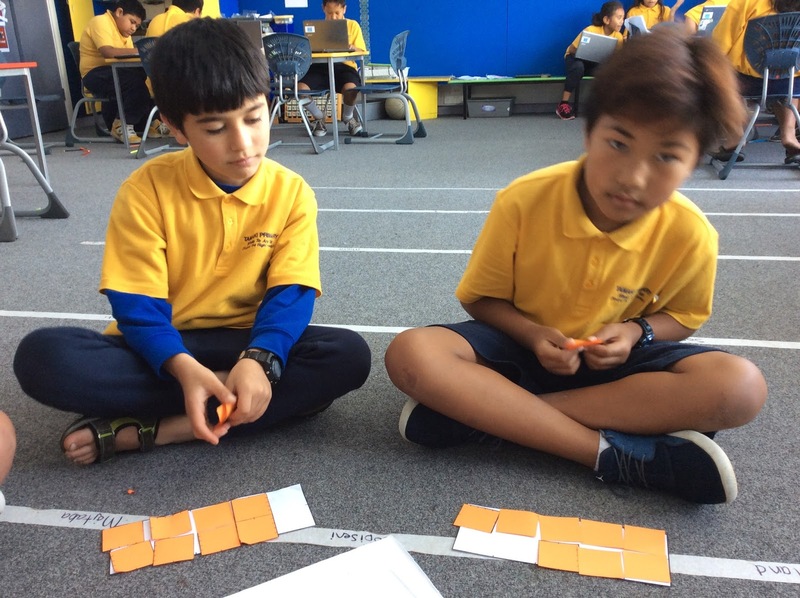 They worked out and discussed between themselves what the numbers meant - 2 whole, 4 tenths and 3 hundredths. Then they would use the paper to illustrate it. I was so proud of these four for pushing themselves to understand how decimals are connected to fractions. We hadn't talked about fractions in class for a few weeks (ala the school holidays) so it was hard and fast revision for them to get tenths so quickly. 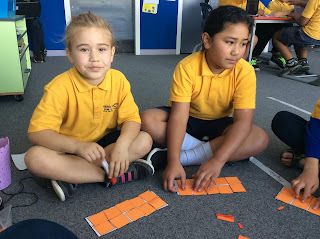 They definitely need more practice to truly understand the concept, and I would have liked to do some addition/subtraction of decimals using the decimats as well, but the curse of the lunchtime bell... Oh well, next week! The decimats, just like when Sue used them, were a fantastic way for the kids to visualise how the pieces got smaller and smaller, even when their 'name' (e.g. hundredths) got larger. I will definitely be using this resource again, it was great! We have spent three days being inspired, building knowledge and making connections. But now we have to go back to school. So, now what? "To be an educator today is to yearn to be better today than we were yesterday"
"Getting better at what we do is part of our DNA"
PD is not another thing on the plate, it IS the plate. HOW CAN I POSITION THESE IDEAS IN A WAY THAT BEST WORK FOR MY STUDENTS? Find the area your students need most, and start there. Be specific. See the story behind the data. Deliberately seek to find our more. Embracing discomfort needs to be the new norm - get used to it. The vision of your school should be dripping off the walls - you should see it, hear it, touch it, taste it. 3. walk around your information together? what do you see? 4. resist solutionitis - what is likely to make the most difference? "It is not education that changes the world. Education changes people. And people change the world." Don't run back to school and just implement all the new stuff you have learnt. That is not good practice. Stop. Think. Act slowly. Choose carefully. Think about what is best for your students. I have been excited about this session ALL WEEK. 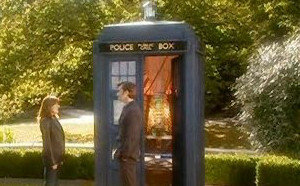 It is called "A teacher tells how she made her classroom bigger than the TARDIS". Say whaaaaaaaattttt? I know, right? Hence my excitement. Here is what the description on the booking sheet says..
"Meet a teacher whose uses LEARNZ in her 21st Century teaching and learning programme to extend the walls of her classroom, inspire learners, and make her time and effort go further. During this session, use your device(s) to step your way through a LEARNZ field trip experience with us. Take part in a short web conference as you “walk-the-walk” with us. Then take up the opportunity to register yourself with LEARNZ, set up a class, enrol and take part in a virtual field trip. Get familiar with how you will be supported on your LEARNZ journey. Find out about using LEARNZ to “Connect” people, places, communities, big ideas, the NZ Curriculum, and technology. Find out about the opportunities with LEARNZ to “Collaborate” in your class, syndicate, department, school, or Community of Learners (COL). 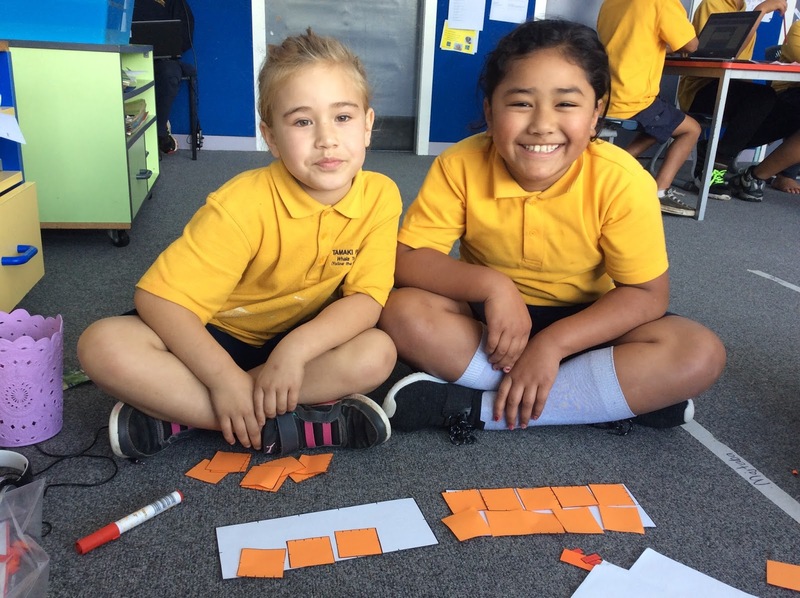 Find out how you can “Innovate” using LEARNZ and what makes LEARNZ an innovative teaching and learning programme." I am excited to learn about how to make my classroom bigger than the tardis because trips are so much effort to organise, you have to do it months in advance, get parent permisison and helpers, most of the time you have to pay for it (a major hinderance in low decile schools). It also doesn't allow you to do in-the-moment teaching type field trips. Doing digital field trips also affords you to go overseas, beyond your city, etc etc which wouldn't be possible in an everyday classroom anyways. 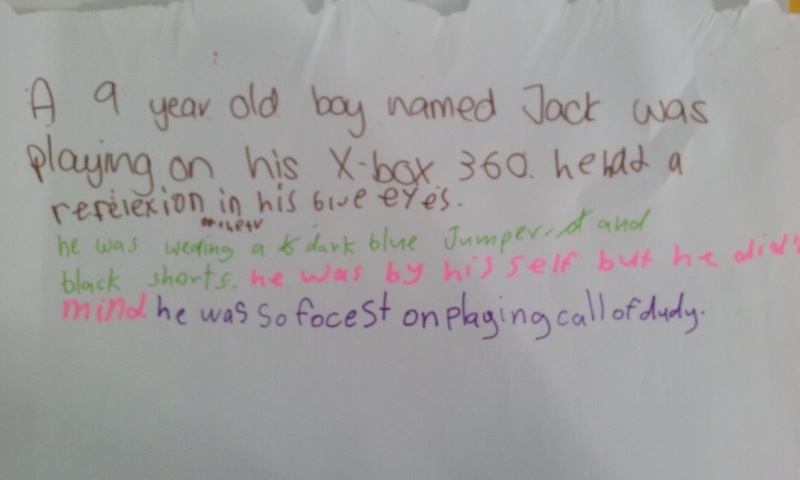 This is done through the LEARNZ website. Any registered NZ teacher can access this resource for free. There are two types of virtual field trips available - past and current. The current trips are pre-arranged and the topic decided by LEARNZ and there is a live components to it as well. Once a trip has happened, it is then stored on the website to be accessed in past tense (however you can't view what would have been the 'live' part). Student reading resource - with audio file opportunity. Student online independent activities. 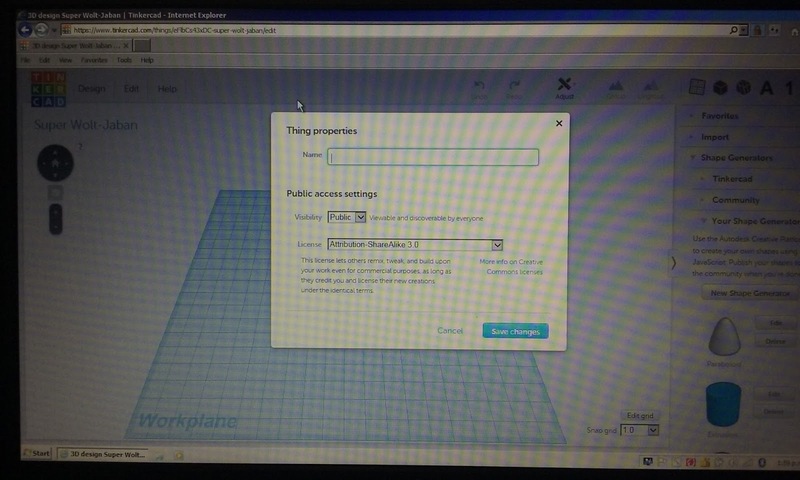 - with a self-marking function that the kids can see. There are prizes available for teachers who complete the evaluation. Even the curriculum links and AO's/KC's are provided! You don't have to use the full programme - you can pick and choose what you want to do and how much you want to be involved. You can also choose to be a silent listening school or you can choose to be a speaking school, asking questions to other schools and the experts who are running the field trip. The LEARNZ team also offer 30 minute introductions to each virtual field trip to help teachers understand the content, ask questions etc. The timetable for that can be found here. Another awesome feature is that when you register, and type in your school name (hence location), LEARNZ suggests other teachers in your school or your area who are also registered, so you can get help if you are struggling and/or even work together on the trip. How cool! There were so many different aspects that I almost felt quite overwhelmed, so to help organise my thinking I made a google drawing to simplify it for myself. This resource was WAAAAAAYYYYY more than I thought it would be - I expected a walk through of the zoo that somebody had recorded sort of thing, maybe some 360 camera footage, but this is just incredible. So much more than I thought it would be. Can't wait to try it out - maybe next year! Leading in a collaborative space. Matt Kennedy and Jaime Power. it depends if you consider single-cell classrooms to be the status-quo, that causes you to think MLE is the different thing. Be explicit with staff about the importance of understanding themselves and each other. 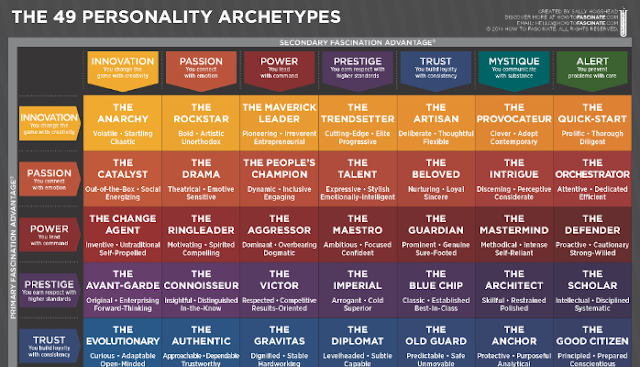 Create expectations and opportunities for staff to discuss different personalities and the impact on collaboration. 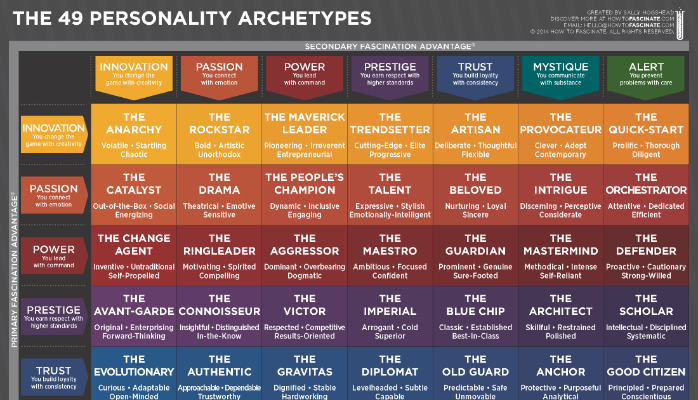 Creating an Awareness of little traits about the people you work with, and using that information to build up your team. For example, if you find out someone is quite introverted, in a meeting you should offer them time to say something because they might not feel comfortable saying things and interupting for themselves. They might have something very valuable to say. Not just for fun - building relationships. It is important to value the aspirations of people NOT in leadership, so when it is time for them to beome leaders they are ready for it. Schools need strong leaders in management, but they still need strong leaders in the classroom as well. Non-leaders having a say in what effective leadership looks like at school - great idea! Having a school-built leadership rubric so all leaders have next steps. Don't just say stuff like "go and get to know your team" - leaders need to model to other leaders. Provide tools to accomplish those tasks. -Provocative question - can all your staff, including teachers aids, the office lady etc, explain/show in under 5 minutes your school vision? -Your school vision should not be a statement - not a question - it should be a story of how you are going to move forward TOGETHER. -Agree with your staff what is appropriate - best practice that is decided by ALL the team, not just the leader. It makes everyone accountable. If something happens, it is then not a 'growling' but a discussion about the agreed values of the team. This afternoon my final session was called Accelerate the reading progress of your ākonga using culturally responsive practices and digital technologies". Here is the description from the booking sheet..
- discover tools that can support you to implement a targeted and personalised learning environment"
I enjoyed this session, was it reaffirmed a lot of work my school has done to build positive culturally responsive culture, and also touched on many things I have been looking at for my literature reviews and will be doing for my dissertation next year. In this, most of the content was not 'new information' to me, but was interesting and thought-provoking none-the-less. 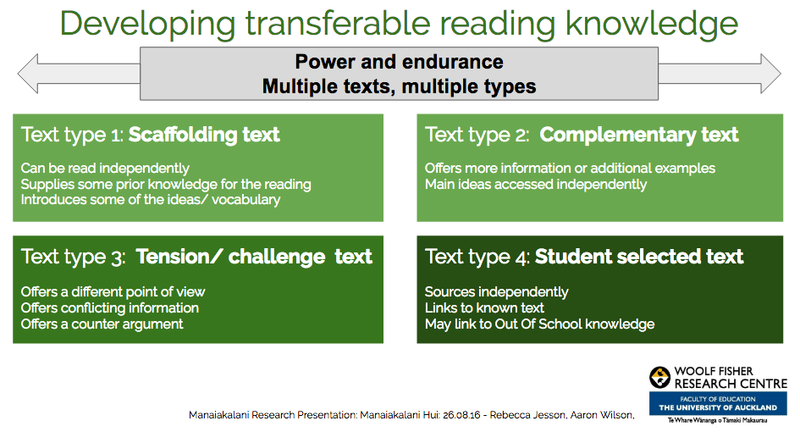 When we are teaching in a culturally responsive way, aiming to accelerate reading or maths or whatever it is, these things need to be taken into consideration. 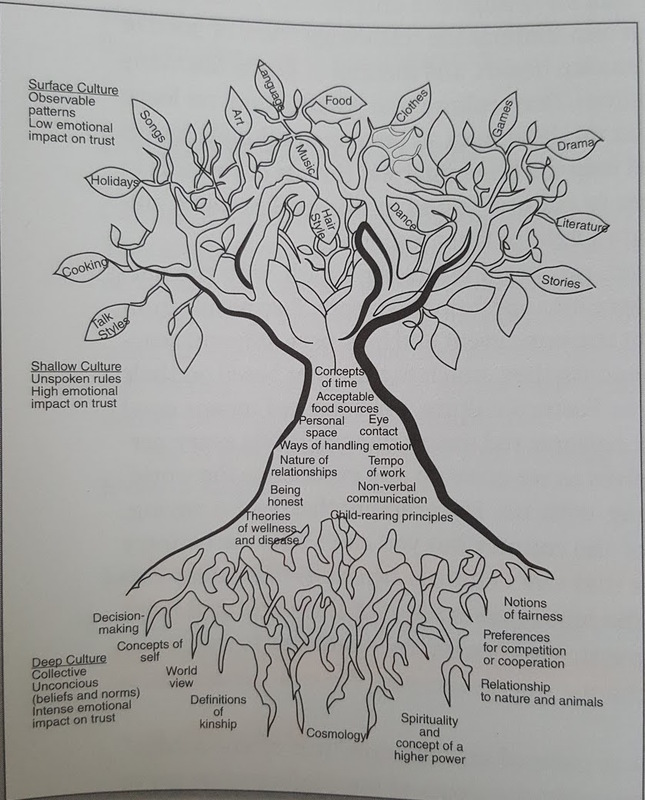 The 'root' of a culture is far more important than the leaves of a culture. This afternoon I am going to a session run by OMGTech. 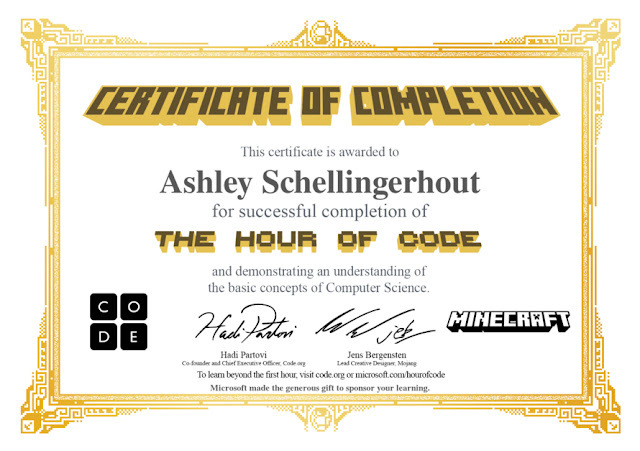 Originally, I was supposed to go to another session, but I have been getting very into Coding and seeing how I can use science and STEM subjects in schools more and more, so I was naughty and skipped my session and joined in on this one.. no regrets! "Coding is hard and you should fail"
The session was then split into 20 minutes chunks, where the partipants were split into four groups, and spent 20 mintues at each 'station' before rotating around to spend the next 20 minutes at the next 'station'. The four 'stations' were Robotics, 3D printing, coding, and unmaking. For each of these you 'made' or 'did' something - it was very active learning. The numbers e.g. (200) are used to indicate the amount of time spent doing that action, not the distance to be covered. That made it a little harder. I did pretty well, I must admit.. Watch the video to see how my robot went! 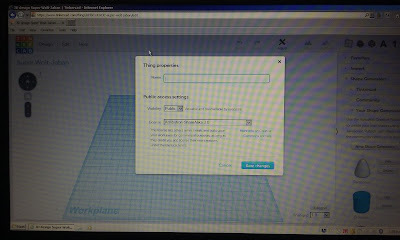 The next station was 3D printing - we logged onto computer which had this open..
Then we just played around with all the functions that allowed you to create a 3D shape. There were generic shapes, letters and numbers from which to choose. You could change the size, location, height away from the ground, colour, distance away from other objects etc. It was hard! I found an ear type shape and decided to make a bunny. It didn't turn out that bad... I found it quite hard to get the eyes/nose/ears/whiskers actually attached to the head. As I was looking at in in a 2D mindset, from my point of view the pieces were almost 'layered' on top of each other and hence looked like a bunny. However, when I changed my view, it was a different story. Both eyes were different distances away from the face, one ear wasn't attached and I don't know what I did but somehow the nose fell off onto the ground? Well, that made me have to really think about the way my object would have been printed. 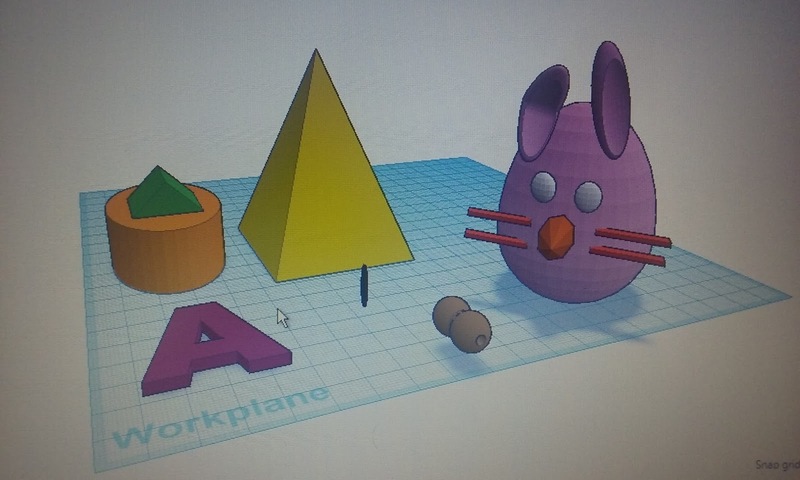 If I had printed it using the 3D printer that they had there, it would have been all seperate pieces, instead of one bunny head with pieces attached. Un-making is exactly what is sounds like. What is the opposite to making? 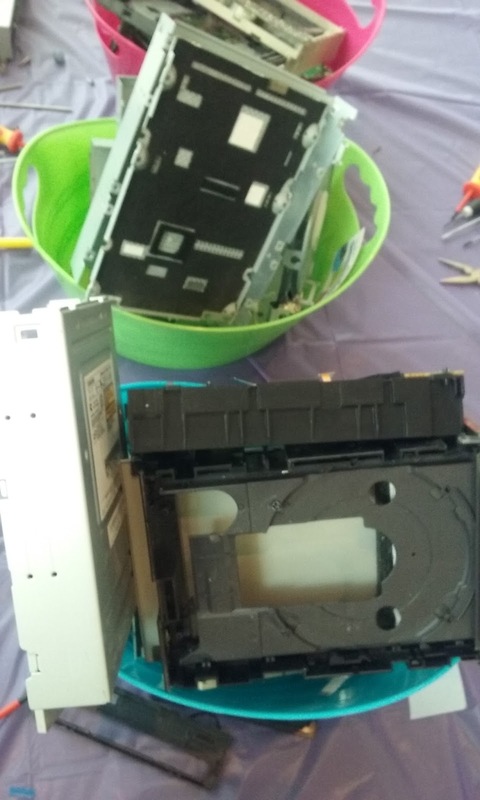 Taking apart. This was not done for fun - it is for trying to understanding how something works and see for yourself the parts involved and how those are connected to each other. The guy taking this 'station' talked about all technology has evolved. His example, was the record player. An old technology, seen by modern peoples as ridiculous and pre-historic. 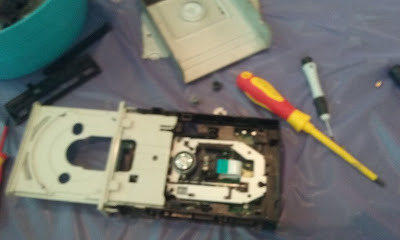 Yet, when you compare the record player to the floppy disc, and the floppy disc to the CD/DVD player, they are essentially, at a nuts and bolts level, the same thing. Admittedly, they do get a lot smaller, a lot more powerful and able to handle much more data - but the way the data is held and pulled off is the same way. People just don't realise it. These were the four things we were asked to 'find' in our CD players once we had un-made them. On the left, the unicorn, which holds and moves the CD; in the middle, the laser and its mirrors, which are used to get the data off the cd and transit the data to the data reader; and the squishy things (yes, really). These are used to hold the laser steady.. I think? Not really sure what they do really, but they were fun to play with..
Each of us then designed a game using these three steps. I made my own game way to hard, and kept dying when I tried to play it and film it. 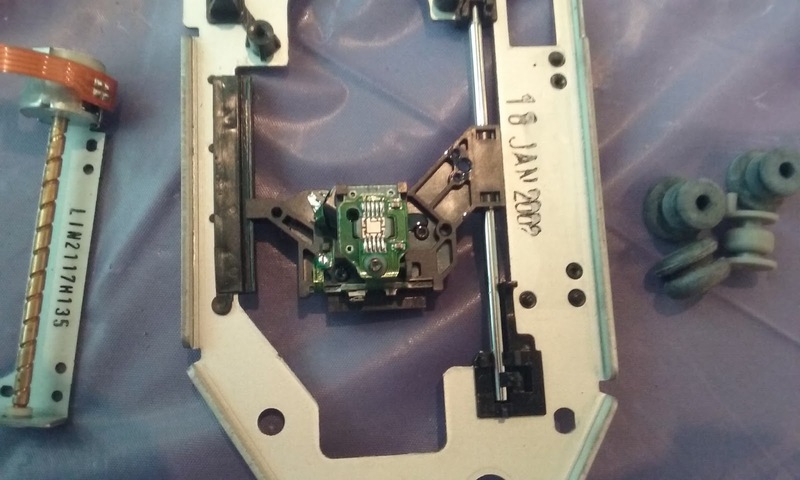 From this photo of making my game, you can see the actual game screen on the left hand size (the maze looking thing) and the gamers code on the right. 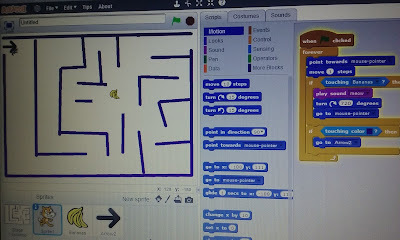 What you do in scratch is you drag and drop different commands for the various characters or the game map itself, into a particular order so that the game follows a particular sequence. This session is called Raise achievements of Pasifika students by empowering parents through Ako Fakataha. (Learning Together). Here is the session description according to the booking sheet..
"Students’ values are reflection of their whanau and families’ values. When parents feel that their children are succeeding, they are empowered to do more and are willing to engage, participate and collaborate in their children's learning. This is how the relationship between parents, teachers and children will work and Pasifika Success will happen. The nut will crack." 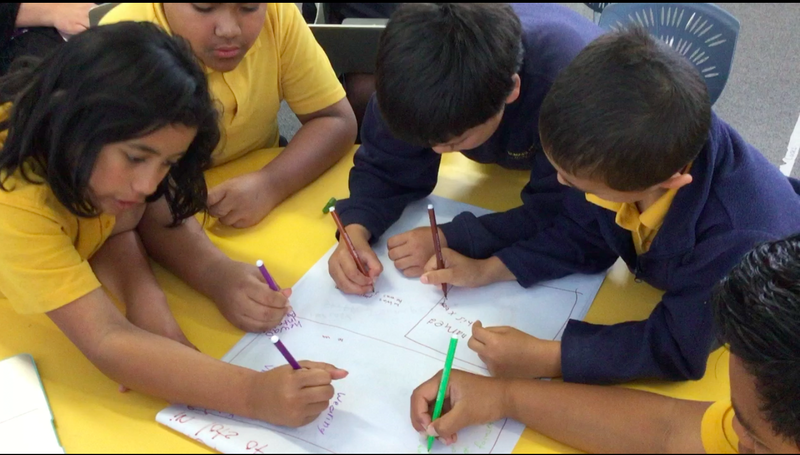 This session was actually run by two teachers from Manaiakalanai school St Pius, Ana Tui and Sharon Middleton. As part of their curriculum review in 2015, Ana, alongside her colleagues and with some guidance from Cognition, began Ako Fakataha. The idea behind this programme was to involve parents of Pasifika students in a way that embraced and celebrated their culture, and was accessible to parents so they felt comfortable and confident to act as themselves. To start the programme, Ana approached some of her Tongan students parents about forming a group in which they could help each other, alongside the teacher as equals, to help their children learn. After some initial reluctance, Ana succeeded and 7 parents agreed to be a part of the programme. 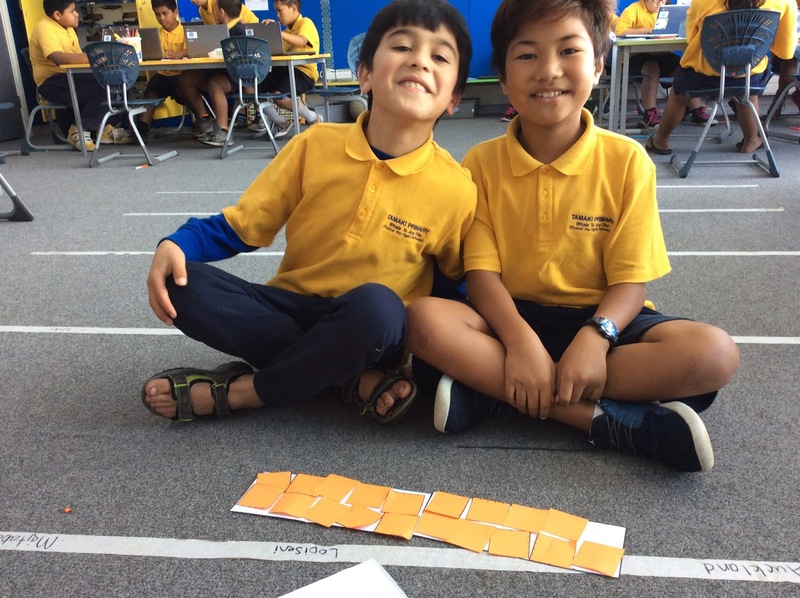 Their first meeting was in her classroom, where they talked it out and agreed on shared values and ideas that would guide their group, including the name Ako Fakataha, which means learning together. They agreed to meet in one of the parents' garages every Monday night. In these meetings, they would start and end with a prayer. This really reflected the parents values and the teachers awareness of the importance of this for the families. Next, the teacher would take one of the kids and model for the parents how to talk to the child about their learning. Ana discussed how typically, Pasifika parents tell children what to do and children listen, but when it comes to learning, parents need to listen and children need to talk. Its literally the opposite. So, it will take a lot of work to change. After this, the parents would listen as their children talked to them about their learning - with Ana helping out, offering advice and sentence starters, reigning in distractions and more. After their closing prayer, in typical Pasifika fashion, they would have a feed! After 25 weeks, with a meeting in the one parents' garage every Monday night, Ana reflects on her programmes' journey thus far. The parents in her group had actually formed a social group without her knowing. They had been going for walks with their kids altogether every Tuesday, walking to school together and for enjoyment. The mums in the group had also began meeting up for coffee groups, each week each mum bought with her $50 which they would then pool together, and give to one of the mums. Over the long period of time, they had each been the recipient of the good will of their group members. Ana did not know about either of those things before the end of term 3; in fact, she felt quite cheated that they didn't tell her about it! Interesting questions were raised at the end of their presentation, such as how can Pakeha teachers get the same success when they don't have the same 'hook' in with parents, as they are not Tongan as the parents are Tongan (in Ana's case); how can parents who typically do not engage with school, be targeted? ; what are ways to use the children to get the parents invested? ; how can the digital technology in our schools also be used to hook parents in? I loved how these questions were discussed, as people from the audience as well as Ana and Sharon built onto what each other had said, supported, celebrated and encouraged each other. Ana and Sharon tell the narrative of one, i'm sure of many, stories which aim to promote success for Pasifika as Pasifika (just like Te Kotahitanga encourage Maori to succeed as Maori). It is talked about a lot that we need to build relationships and engage with our parents to help their children succeed; nobody that I know of has taken it as far as Ana has with her Ako Fakataha programme. To get successful outcomes for these students, we need to meet them where they are..
And yes, sometimes that does mean meeting them literally in the neighbours garage. This mornings keynote speaker is Michael Fullan. Michael Fullan is well known for his ideas about Deep Learning. He has three key points.. Humans are innately wired to connect, wired to create and wired to help humanity. From the moment we are born, we connect with our parents and those around us, wether we realise it or not. So how does our school system encourage us in these? Well, mostly, it doesn't.. So how can we change our education system? 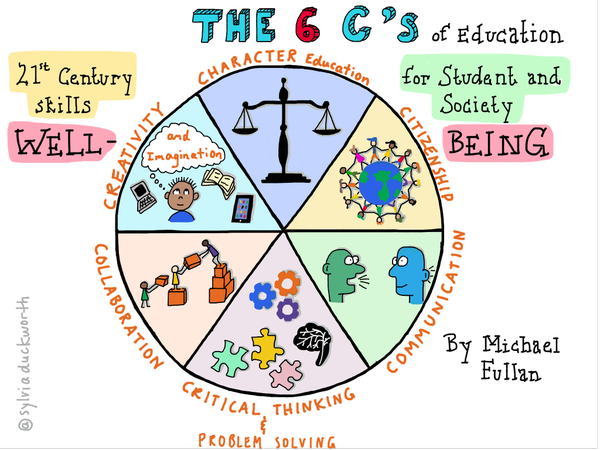 Michael believes that to change our system, we need to focus on these three things..
Six key things, called 'the 6 C's', that define what kinds of students we should be producing in the new education system. 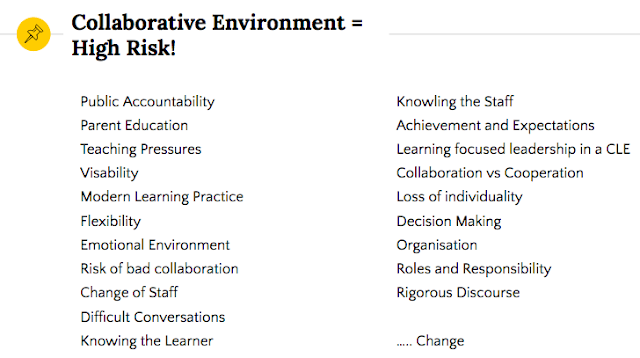 Key Competencies in NZC align with these 6 C's. -breakthrough leadership - respect and reject the status quo, be an expert and an apprentice at the same time, experiment and commit. Another thing to consider when you think about changing education, is social media. In todays world social media is everywhere and almost everyone is on it. It is hugely powerful. -distribution and concentrated connection is the new power. -the job of education is to produce better citizens for tomorrow, today - it is an agent of change. In the future, we don't need lots of good leaders. We need good citizens, and the leadership will be embedded in them. 10 ways to die in deep learning. 9. if you aren't willing to set the world a little askew. 10. if you don't realise that creating deep learning is a countercultural experiences. Don't change your ways to fit the framework. Make the framework fit what you want to do. 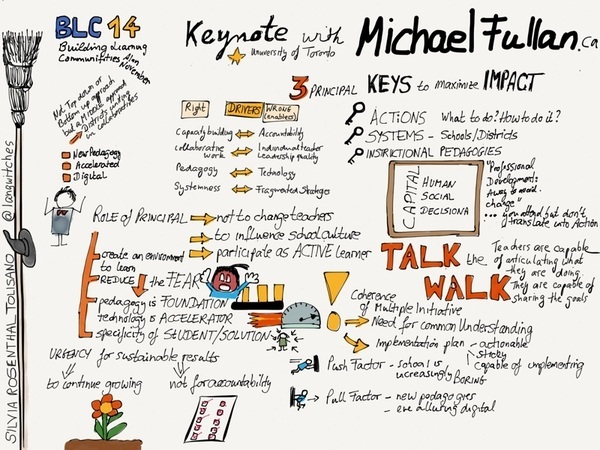 I found these sketchnote online, which were made for a different conference, but still reflect the key ideas Michael presented today.